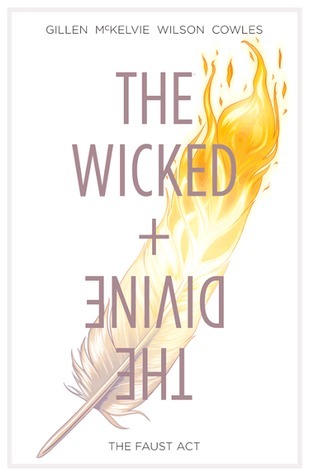 What drew me to buying The Wicked + The Divine was its beautiful artwork. I know, so shallow but I’m such a sucker for beautiful art (very jealous of anyone that can draw well, let’s be honest!). I was also very intrigued by the concept of gods — I adore mythology a lot and was obsessed with it in high school — and gods that incarnate as humans but die after two years? What in the world, sign me up! The Wicked + The Divine is certainly very odd, and I can tell that it’s not going to be a book that everyone would enjoy. The collection of the first five issues provides a good introduction to the world, where these gods have reappeared following a 90-year hiatus and are pop stars going around the world providing these “experiences” through concerts. People literally faint during these shows because they can’t handle the experience. Lel. The story of these gods are told through the perspective of Laura, a fangirl that suddenly finds herself in the middle of a very big godly mess. A murder occurs, and the accused is the god Lucifer (or Luci), who certainly acts guilty. Laura finds herself trying to absolve Luci’s crimes because the god had promised her power if she helped out. This book is very beautiful and very vibrant. Everything is bright, bright, bright and it makes for some amazing imagery. The gods in themselves are very diverse, as they span across different mythologies and races. It was very good to see such diversity very present because there are just so many awesome mythologies out there that readers are unaware of. I enjoyed The Wicked + The Divine overall, but I also felt like there was just a little something missing from the overall story. You are left with a lot of questions by the end, and there was just something that didn’t click together overall. I think some more backstory could have helped with fleshing out the purpose of the gods being on earth. Looking forward to the next volume nonetheless!